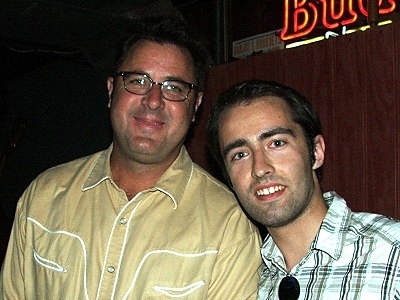 Vince Gill is often called "the most loved person in country music". 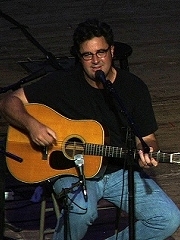 The multiple CMA Entertainer and Male Vocalist of the Year has also earned 20 Grammys and dozens of other major awards. 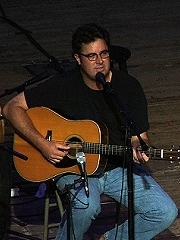 As an acknowledged musician and songwriter Vince has collaborated on hundreds of albums for other artists and his charitable work is as extensive as his music career. Everybody knows that when Vince isn't out on tour, he plays with the Time Jumpers at the Station Inn in Nashville on Monday nights and that's also where I got to interview him. You are credited as an actor in the Maverick movie but I never spotted you. Are you really in there? "You're lucky!" (laughs) "I was just in the background on the boat scene watching the gambling or something. I never wanted to be in movies at all and begged them for not having me in that one, but unfortunately they wanted everybody that had done a song in the soundtrack to show up somewhere in the movie. I'm in there in a beard, a funny outfit and I'm glad nobody can recognize me." Did you get any offers to be in other movies? "I guess maybe some, but people knew that I had no interest so I don't know. Once again, if it came through management, they would turn it down, I wouldn't even know it." What music video did you have most fun making? "I never liked any of them..." (laughs) "I told you I didn't want to be in movies and I don't like making videos either." Not even "One More Last Chance"? "That was fun because I got to play golf for a couple of days. Those that were most fun were like 'One More Last Chance', 'Don't Let Your Love Start Slippin' Away', 'What The Cowgirls' Do. I'd say the most fun was 'What The Cowgirls Do' with an actor named Calvert DeForest, who played the character called Larry 'Bud' Melman on the David Letterman show for years. He agreed to come down and be a part of that video and we had a blast." In the "What The Cowgirls Do" video there was Rodney Crowell playing fiddle and I spotted you playing fiddle in one of his videos, "Big Heart". Was it a deal? "Oh no, we're just best buds. Hey come in and do this misery with me if I come in and do this misery of mine and so." Do you still play fiddle from time to time? "No, not very often, I'm terrible. I can play a part, a part here and there, not making sound too bad. This world is full of so brilliant fiddle players so it's kind of painless and pointless for me to play that." You've done so many collaborations through the years, but is there any that you've always wanted to do but never got a chance? "There's as many that I haven't done that I wish I could do but I never dreamed I get to do what I've done to this point. I don't really try to put things together, I like things to happen naturally. If something wanted to come together, to work with people that I've never have, I would welcome the opportunity." You have a long history with CMA. What's your all time favorite CMA Awards moment? "There's been several. One was the acceptance speech of Cindy Walker when she went in the Hall of Fame, that was a great moment for me. There were so many great musical performances. I really enjoyed Mary Chapin Carpenter's song called 'Opening Act'. Nobody really knew who she was, there were first songs she ever recorded and made a big impact and she went on to have a great career. You gotta understand I've been going to that show 26 years, hosted them for 12 of those, so I got to see most of it." You've won an incredible number of 20 Grammys so far. Is there any that tops the rest, that you're extremely proud of? "Maybe the last one, because you figure you never get another one. The first one and the last one. You never thought you'd get the first one, you never thought you'd get the last one. I think the fact that there's 20 of them is a testimony of the fact that I was always willing to collaborate with other people. I'd say that more than half of them is because of an instrumental record I made with somebody, I won a Grammy for producing one of Amy's records, songs I've written. So it was extra special for me because of the diversity in those Grammys that I have. It's not just for me as an artist. It means a lot that I feel like a pretty well rounded musical guy and I like to do a little bit of anything." 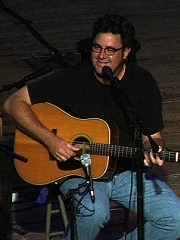 You first met Ricky Skaggs in his band in Kentucky in 1975. What's your earliest memory of him? "Actually I was still in high school when we first met. We both played around a lot of the same bluegrass festivals. I'm a huge fan of Ricky's. He was a great friend and we played in a band together for a short time. It was probably not a great time for us to be in the band together because the band wouldn't make much money and I was the last guy in, I wasn't really a part of the band, so it didn't last very long, about 6 or 8 months. He's carried the torch so grand for acoustic music and the music that he grew up on, bluegrass music and there's not many any better than Ricky." About a year ago Eddie Bayes suggested that the Notorious Cherry Bombs may reunite again. Are you working on it or is it too early to say? "I don't think so. It's always fun to get together with those guys and make records. There's such long and dear friendships that go back so many years, 30 plus years. If anybody wants to do it, I'm not a hard sell, I'm in. The last record was fun, but you know largely ignored. I don't think that matters, I'm glad we made it and we had fun making it and we will probably do it again. The opportunity will present itself, you know, wait and see." You're just working on a new album and my question is what disc of the These Days project is the new record going to sound like? "Hmm, a good question. Hopefully none of them. I think that my records have always been in the mercy of the songs and the songs dictate what kind of record it's gonna be. I think a lot of the songs are not much like the stuff I did on the last record. I mean I'm talking in subtleties. I still sing and play, have the same brand, and the song have the same similarity, but in my mind they're different. I'm just trying to be authentic with them and make the records that really serve the song the best. And where it falls and what genre, any of that is so unimportant to me. I'm having fun doing it." Jenny got married two months ago. Are you ready to become a grandpa when it comes? So you'll get yourself a walking stick and a pipe? "Yeah, but I think they will probably wait a little while with kids. They don't seem to have any rush to have kids and that's probably pretty healthy. They didn't rush to get married, they were together for a long time before they got married. They make a great pair, they're good for each other. I see nothing but a great life in the two of them." Do you mind if your fans approach you in public places? "No, I like people. I've never run from any part of my career. I know how normal I am and I think it totally surprises people that I am as approachable as I am. It's all because of I want to be normal and I want to be seen as normal. I love what I do and I'm grateful that people like what it is that I do. It doesn't make me to run off and be reclusive and hide. I'm not afraid of anything, I just wade right into the world and if I get recognized, no big deal." 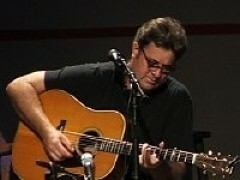 Vince Gill - "What The Cowgirls Do"
(C) Petr Mecir 2010. All rights reserved.